The hosts are wringing their hands. “This snow,” they sigh, almost blaming themselves for nature’s untimely intrusion into what was, a few minutes ago, a clear wintry morning. We had been prepped for a ride into the skies which would take us within air-kissing distance of the big four — Monte Rosa, Matterhorn, Gran Paradiso and the creamy scoop of Mont Blanc, the highest peak in Europe at 4,810 metres. But when the rotating spherical cable cars of the freshly minted Skyway Monte Bianco deposit us at 11,000 feet, we are ambushed by snowflakes and errant snowballs, and a mantle of mist conceals the Alpine view. Some members of the group are delighted though, especially those who have never been in the midst of ‘Snowdonialand’. Much to the relief of our hosts who go into a worried huddle anyway and prod us towards the caffeine counters. We are geographically in Italy but sipping our foaming hazelnut-infused lattes in France! The cafe we find ourselves in is perched between the two countries in a way that half of it falls on that side and the other half is on this side. And we have crossed the boundary line simply because all the tables are taken at the Italian end. We go crystal-gazing next at a permanent exhibition of the ‘jewels of the mountains’ — exquisite pieces ferreted by passionate mountaineers — before we divest ourselves of coats, gloves, cameras and caps at the enormous Pavillion di Mont Frety restaurant on a lower floor. Chef Luigi Ballisai has laid out a formidable spread. Upma and yellow dal nudge bruschettas and lasagne. Pizzas jostle for space with the humble raita and dessert has us torn between apple pie, cheesecake and good old sevian kheer. Then comes the big surprise. To make up for the ‘loss of panoramic view’ on top of the mountain we are bundled into helicopters that propel us into the mountains! The exhilarating eight-minute ride takes us as close as is permissible, to the jagged range that wears a cloak of white even as mini snowstorms swirl deep in its recesses. Courmayeur, for that is where we are, is a romantic, medieval village tucked into the valley of Aosta, the smallest region of Italy. Developed around two historic churches, the serene village, known best for its near-perfect ski pistes, houses a potpourri of bars, eateries (Pizzeria du Tunnel gets a high five), owner-driven shops and gourmet stores on a cobblestone car-free main street. It is on this street that some of us, along with a population that startles with its sheer numbers, sit on vacant steps with beer cans in hand, to cheer the winning trio of the ‘Tour of the Giants’, the toughest trail in the world and the first mountain trail involving an entire region. Paramedics wait on the fringes and children wave flags from atop their daddies’ shoulders. 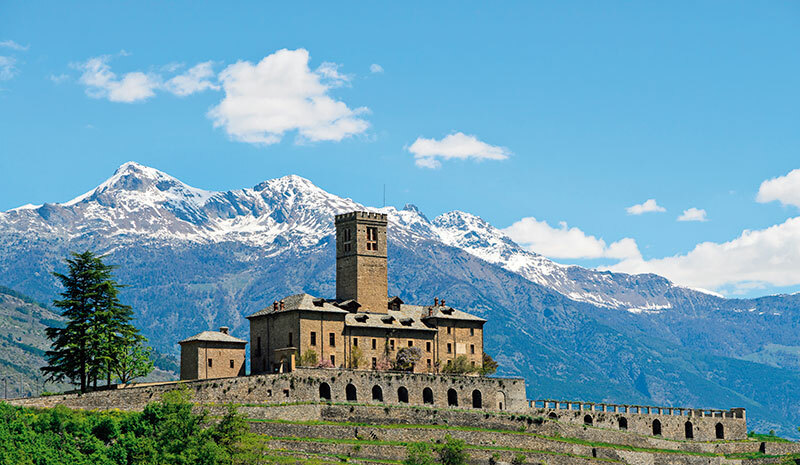 Aosta town, founded in 25 BC, comfortably nudges Roman remnants. Its squares, shops and gelaterias have sprung forth, wrapping themselves around, through and under ancient gates, bridges, fountains and courtyards. The famed Augustus Arch stands tall at one end of the main street. Post an indolent repast of spiced meat skewers, dried fruit pulao and ginger-cinnamon cake at the very stylish Brasserie Café d’Europe, just off Piazza Chanoux, we indulge in the hot buy of the day: the grolla or friendship cup typical of the region. 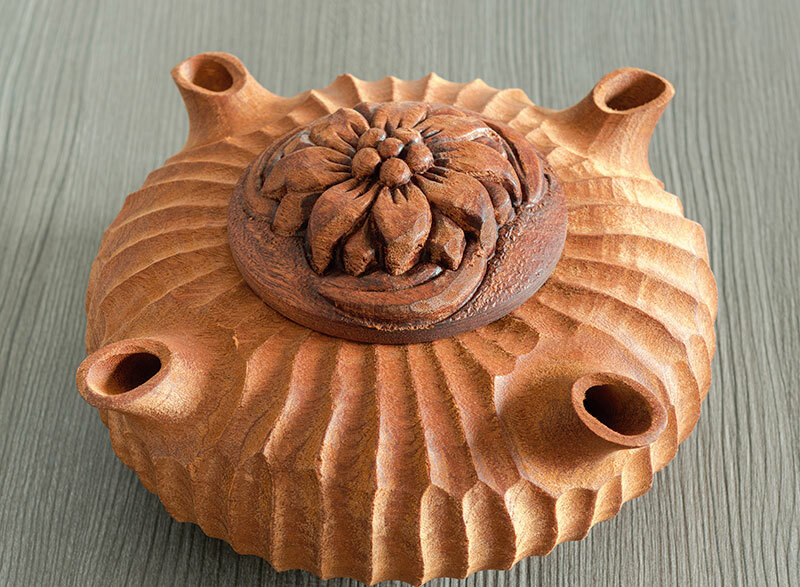 The round wooden container, often finely carved and handmade, has a varying number of spouts from which ‘friends’ drink traditional spiced Valdostana coffee. We think it may work well with wine too! 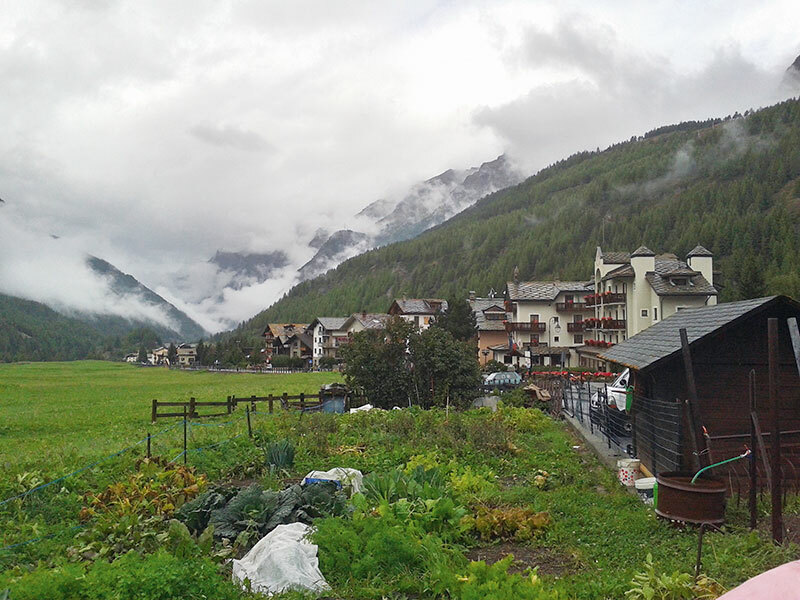 When we reach Cogne it is raining. So there dies the hope of spotting the rare ibex, 4,000 of whom roam freely in Italy’s first national park, the Gran Paradiso National Park, that shares a boundary with France’s Vanoise National Park. The two together make up the largest protected sanctuary in Western Europe. It is a unique area bursting with woods, mountains, valleys, glaciers and chestnut groves. We make the short trek — and no one slips — up to the Lillaz Waterfalls where the water, clear as crystal, cascades down with attention-getting sound. Never mind the annoying drops of rain, the cell phones are whipped out of warm pockets and a series of selfies taken against the thundering wonder. Post the brief trek in the wet, we gratefully warm our toes at the cheery Sant’Orso on the fringes of the Park, dig into authentic Cogne custard and decide to leave the ibex sighting for another day…. 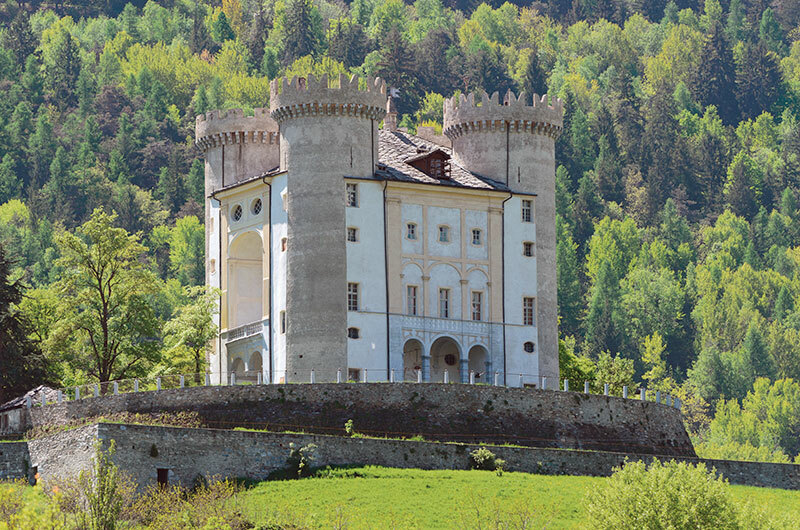 REACH Courmayeur by road from Aosta (37 km), Como (248 km), Milan (217 km) or Turin (146 km). STAY at Au Coeur des Neiges, the chalet-style resort nestled in the bosom of Mont Blanc and savour a mascarpone mousse with wild berries in the warm-toned interiors. Giorgio Armani’s team recently shot their ad campaign here. DINE at the charming Auberge de la Maison and choose from an eclectic offering of homemade tagliolini, paprika-scented prawns, saffron-infused risotto and stone-ground polenta. The whipped cream in a bowl looks like a mini version of Mont Blanc! TASTE the fruits of your efforts at Pilier D’Angle where you can barbecue slivers of meat and fish just so, at the table while munching on a smooth-as-silk avocado salad. BUY wooden friendship cups, dried porcini mushrooms, snow globes, white wine from Cave du Vin Blanc de Morgex et de La Salle. REVEL in the joys of snowboarding, snowshoeing, ice climbing, snowbiking and whooshing into Chamonix, France a hop, ski and jump away!